Younger & Wiser goes behind the scenes of poems, enriching an already appealing and rewarding collection. 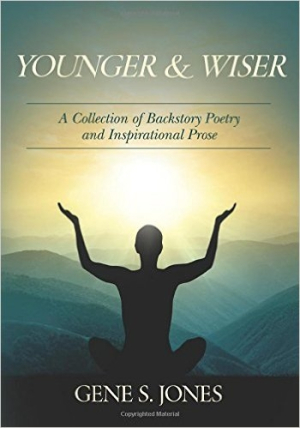 Gene S. Jones’s Younger & Wiser is an inspiring collection of poetry with mainstream appeal that merges ardent verses with corresponding backstories, while also offering a peek into the writer’s process. In conversations with fellow writers, Jones realized that the circumstances leading to literary works were often more intriguing than the works themselves. Recalling a poem he penned about his father’s premature death, Jones was struck by the idea of recounting the events that inspired his writing. His approachable free-verse poems are fluid and varied. Accompanying backstories bring forth the autobiographical nature of the work, though each poem can be appreciated on its own merit as well. Poems cover a broad range of topics, including family, acquaintances, dreams, meditation, and the environment. The quietly graceful verbal portrait “Sketch” captures a man and his cat, and its backstory reveals the poem’s inception on a brown paper bag. “Worm’s Eye View” takes a sobering look at the value of humans versus earthworms in the ecosystem. Emotional themes of love and loss are also featured throughout. In the poignant “Final Child Orphans Club,” the lines “with no remedy / no cure / no way back” showcase the permanence of the situation. Poems often prove an extension of Jones’s frequent travels. “The Search” examines a lonely, contemplative time in Paris, during which the poet attempts to put his life into perspective. After returning to the United States, he ultimately sets a course to refocus his career and romantic goals. In “Meditation,” Jones relates the experience of reaching a purely mindful state for the first time. The backstory highlights the genuine restorative qualities of nature. Here the harmonious Hawaiian landscape brings Jones not only mental clarity, but also spiritual balance. While the majority of the poems include a companion narrative, a few do not. “Self Portrait” delves at length into the poet’s major life events; each happening is synonymous with a rebirth. Tapping into memories of childhood, family tragedy, lost loves, renewed faith, and ultimately learning to live a fearless life, its detailed revelations create additional background. As this compilation covers a thirty-year span, for the most part the inspirational narratives were composed long after the poems were initially written. The backstory for “Path to a Dream” is the sole literary entry created at the same time as its companion poem. Stemming from an underwater experience reflected through the writer’s mind’s eye, its essence ponders the nature and power of dreams, and of a person’s willingness to embrace dreams’ mysteries and pursue them with passion. With a groundbreaking style that helps bridge the gap between eclectic verse and creative memoir, Younger & Wiser goes behind the scenes of poems to enrich an already appealing and rewarding collection.